ESPN once again was the top cable network last week, averaging a 2.6 household rating and 3.15 million total viewers in prime time, thanks in large part to its “Monday Night Football” and “Saturday Night NCAA” presentations. 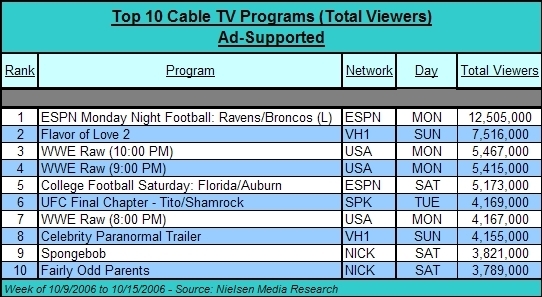 For the week, ESPN was #1 in all three core demos, averaging 1.55M A18-49, 1.57M A25-54 and 747,000 A18-34. 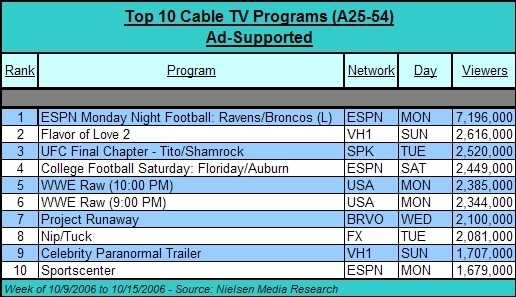 The highest rated program for the network was the Ravens/Broncos MNF presentation on October 9th, which scored an 8.5 household rating (9.46M households) with 12.51M total viewers. That presentation was also the top ranked program for the week on cable in A18-49 (6.39M viewers), A25-54 (6.41M viewers) and second in A18-34 (2.96M viewers). USA Network then came in second for the week, averaging a 2.0 household rating (1.84M households) and 2.44 million total viewers, led by its Monday night WWE Wrestling. For the week, USA Network placed second in all three core demos, averaging 1.10M viewers in A18-49, 1.08M viewers in A25-54 and 522,000 viewers in A18-34. The three hour WWE program from 8:00 PM to 11:00 PM on Monday night was the networks highest rated program delivering a 3.1 household rating (3.49M households) with 5.02 million total viewers. The final two hours of the program averaged 2.77M viewers in A18-49, 2.45M viewers in A25-54 and 1.53M viewers in A18-34. Third place then went to TNT, which averaged a 1.7 household rating in primetime (1.55M households) and 2.02 million viewers. For the week, TNT placed fourth in A18-49 with 875,000 viewers, third in A25-54 with 950,000 viewers and eighth in A18-34 with 366,000 viewers. The networks most watched program for the week was an episode of “Law & Order”, which was watched by 3.36M total viewers. It had no programs ranked high enough to place in the top 10 demos of A18-49, A25-54 and A18-34. Fourth place went to Cartoon Network, which averaged a 1.5 household rating (1.35M households) and 1.69 million viewers. Cartoon Network had no programs ranked high enough for a Top 40 placement, nor did it have any programs that placed in the top 10 of the key A18-49, A25-54 and A18-34 demos. 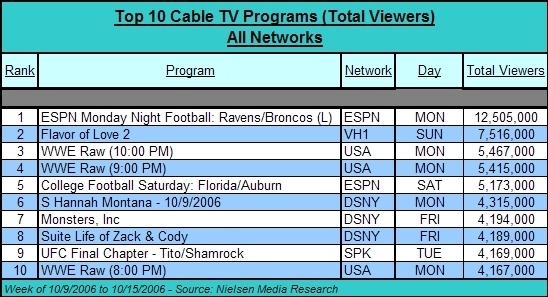 Rounding out the top five then was TBS, which averaged a 1.3 household rating (1.17M households) and 1.53 million viewers. 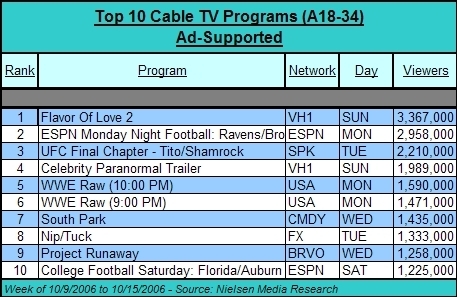 Like TBS, Cartoon Network also did not place any shows in the Top 40 in viewers, nor did it have any programs ranked in the top 10 of the key demos. Among the non-ad-supported cable networks, Disney Channel was once again the top network, averaging a 2.4 household rating in primetime and 2.88 million viewers, which would be good enough to place it second for the week among all cable channels. Its highest rated program for the week was the October 9th presentation of S Hannah Montana, which averaged a 3.0 rating and 4.32 million total viewers. 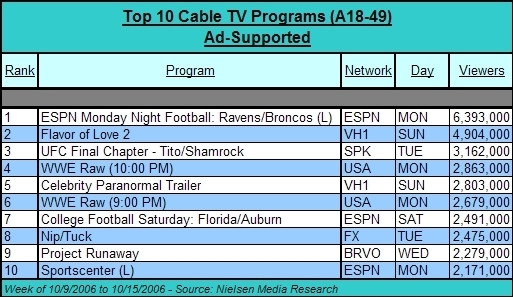 Charts for the top 10 programs in cable (all networks, and ad-supported only), and the top 10 ad-supported programs in A18-34, A18-49 and A25-54 follow below.